A reliable source for Floor Gratings information and a resource for accessing leading Floor Gratings and suppliers. Floor gratings are metal formed grid patterns made to provide traction and allow for water drainage over an opening. Because grating is strong and lightweight, it is popular for a wide range of uses. Grating applications include treading, barrier create, building material, ventilation, drainage, load bearing and decoration. Gratings are common in industrial and commercial facilities and are used in production plants and on sidewalks where liquid or debris may be present. The increased tread of a floor grating helps to improve safety by preventing water buildup or allowing a walking surface to become slippery. It is not uncommon for municipal and federal laws to require different types of facilities to use floor grating on walkways or in areas where there is a potential for fluid leakage. SlipNOT® manufactures an all metal, slip resistant coating that is applied to steel, stainless steel or aluminum gratings. SlipNOT® gratings are available in a variety of standard and ADA compliant styles or SlipNOT® can coat customer supplied material. McNichols Company is committed to customer satisfaction which includes service, quality and performance. Some of our products include floor gratings, bar gratings, aluminum gratings, safety gratings and more. Our seasoned engineers are experts at manufacturing durable gratings. These high quality solutions are specialized for a variety of industries. We take pride in saying that all of our manufacturing processes happen right here in the United States. Since 1959, Niles, an ISO 9001:2000 company, has been a floor gratings distributor that offers standard & flattened expanded metals & gratings, including walkways & stair treads. Indiana is the benchmark other manufacturers strive to achieve. This financially strong, family owned company with over 35,000 sq. ft. of manufacturing area offers cost-effective, quality structural, decorative products. Since its founding in 1992, American Grating has manufactured top quality molded and pultruded fiberglass gratings, pultruded structural profiles, handrail and ladder systems, and hand lay up custom components. People have been producing metal grates more or less since they have had metal. They first cropped up during the Bronze Age. One example of them comes from the Italian city of Elea (later known as Velia), which was controlled by Rome by the 3rd century BC. There, they had a street with drainage grates that acted as gutters. By the 11th century, floor grates were also used in home heating to hold coal at the bottom of fireplaces. Floor grates from this time were primarily made from cast iron and steel. They were much more ornate than modern floor gratings, which are now made more for function. Sometimes, for aesthetics, people still do request antique-looking or authentic antique gratings. Over the years, another popular application of floor gratings has been sewage draining. In 1884, James T. McHugh received a US patent for sewage grating. Today, manufacturers fabricate floor grates for not only the aforementioned uses, but also for countless other applications, such as industrial flooring and safety. Part of the reason they have been able to diversify floor grating uses so successfully is the fact that they can make them with far more materials than before. One popular example is fiberglass. As the years go on, we can expect floor grating manufacturers to use even more diverse materials. Manufacturers fabricate floor grating grid patterns using a wide variety of processes, including: welding, metal plate expansion, perforation, pultrusion and/or molding. They may follow up any of these processes with hot-dip galvanization. Welding is a popular way to make extremely rigid floor gratings. Manufacturers perform welding, or fusing via heat, on metal or fiberglass bearing bars. Mostly, welding, along with riveting and swaging, is used to make floor grates used as platforms, trench grates, safety barriers and walkways. Metal plate expansion involves slitting and expanding metal sheet into predetermined sizes. Manufacturers like to use expanded metal to reduce waste. Metal perforation involves creating hole patterns via a punch or a press. Pultrusion is an automated process during which impregnated bar resins are pushed through a die. Pultrusion is most popular for fiberglass grate fabrication. Pultrusion is valued for its high quality, repeatable results. Molding of gratings begins when manufacturers manually layer the materials until they reach the chosen thickness of the grate-to-be. Then, they place the grate inside a mold, where it sits until it cures. This process is used to make reusable plastic gratings and FRP gratings. Hot dip metal galvanization is a strengthening exercise. To perform it, manufacturers dip newly formed metal gratings in a bath of hot zinc oxide. Hot dipped galvanized gratings are extra resistant and protected against oxidation and corrosion. Manufacturers usually make floor grates using strong metals like: iron, carbon steel, stainless steel, galvanized steel or aluminum. Often, they also use reinforced plastic or fiberglass. Manufacturers select materials based on material properties like: strength, flexibility, corrosion resistance, abrasion resistance, etc. Depending on the application, manufacturers can make floor gratings in many different thicknesses, dimensions and patterns. They determine patterns based the required strength properties of the floor grating and the architectural needs of the application. Examples of architectural needs include: how they want fluid to flow, how much traction they seek, the percentage of area on the grid that must be open to water, and the amount of light that must pass through the grate. Common patterns include: ovals, diamonds, and squares, though manufacturers also design custom patterns. Heavy-duty gratings are welded or created with pressure-locked bars. Floor grates like this are less likely to warp over long periods of time. 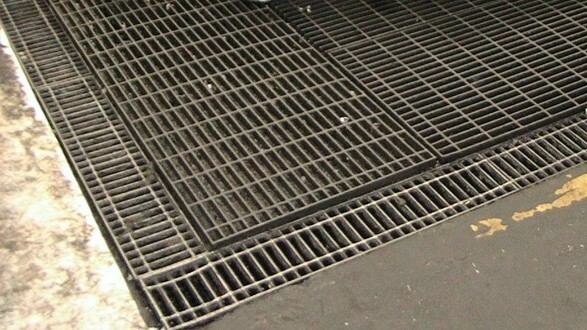 Trench grates, also known as floor trough grates, can be found in industrial facilities and even on city sidewalks. These long and narrow grates double as a drain gate that people can walk across while still giving workers an access point to pipes and systems underneath. Stair treads are grates featuring cut-out holes with serrated tooth inner diameters. They are designed to prevents people from slipping on the stairs. Made using expanded metal or perforated metal, stair treads do not allow for mud, water, or other materials to build up. Bar grates, or bar gratings, are made with load bearing and cross metal bars machined together for strength. Typically, bar gratings are used as mezzanine decking, walkways, stair tread, platforms and the like. Metal gratings are used to support non-slip surfacing, surface filtration and high strength applications. Steel grates and stainless steel grates are used for all the same applications as other metal gratings, plus applications in highly corrosive environments. Fiberglass grates, or FRP grates, are lightweight, slip-free and immune to rust and fire. Fiberglass gratings work well as stairs and floors where floor strength is extremely important. Plastic grates are lightweight, slip-free, easy to install, invulnerable to rust and flame retardant. Floor drains are grates used in plumbing to remove standing water from the floor. Architectural are lattices integrated into builds for the purpose of aesthetics or function. Architectural grates may be metal or fiberglass. Floor gratings are an excellent addition to any flooring. Some of their many advantages include: slip resistance/better grip for factory vehicles and machinery (forklifts, palletizers, etc. ), increased worker safety and more efficient work environments. Drainage grates in particular offer the advantages of: decreased occurrence of moisture-related bacteria growth, decreased risk of flooding, more efficient draining. In addition, floor grates are versatile and easy to customize. Some common floor grating accessories include: washers, bolts, fasteners, locks, butterfly clips, hold down clips, hold down clamps and channel connectors. Often, suppliers offer kits with extra accessories such as these, so that you can be ready to replace on at a moment’s notice. To find out what accessories are right for you grates, talk to your manufacturer. 1. If working with bar gratings, install your bar gratings with the cross rods on the top size. This creates more strength. 2. Install (at smallest) a 1” bearing along with your bearing bars that are 2 ¼” or smaller. (These are usually provided.) If your bearing bars are 2 to 2 ½”, install them with 2” bearings. 3. Make sure all your clearances stay within the parameters of your grating’s dimensional tolerances. 4. If you are installing circular gratings, make your circular obstruction cutouts are at least 2” larger than the obstructions themselves. One of the best ways to care for your floor grates is by cleaning them on a regular basis. This is especially true if your grates are meant to be slip resistant, as buildup can dull texture. Some cleaning jobs require something simple, like compressed air cans or a soft bristle brush to remove debris. Other cleaning jobs require industrial cleaner. The type of cleaner you should use depends on the nature of the job and the type of material from which your grating is made. For example, to remove rust from stainless steel, try using diluted muriatic acid (no more than 1 part acid to 1 part water). Some cleaners work great for one job, but terribly for another. For example, you can successfully use alkaline and organic enzyme cleaning materials to remove oil and grease from some steels. Try to do this on others, like stainless steel, though, and your grate will turn black. The best way to know what cleaner to use is by consulting with your supplier. Depending on your application and industry, your floor gratings may require the adherence to different standards. For example, if your floor grates are to be accessible, they need to be approved by ADA (Americans with Disabilities ACT) standards. They have standards for grating qualities like: stability, firmness and slip resistance. Grates to be used on the road will need to meet DOT (Department of Transportation) standards. Also, many industries base their standard requirements on ASTM grades, which are put out by ASTM International. ASTM has quality and safety standards applicable to the marine industry, the steel industry and others. They also offer advice per: grating material, material treating processes and grate forming processes. For the best results, get a floor grating that has been evaluated and graded on the ASTM grade scale. If you are interested in purchasing standard or custom floor grates, you need to work with an experienced manufacturer who can provide you with the best product and services possible. We know that there is a lot of competing noise out there on the internet; that’s why we’ve put together a list of industry leading floor grating manufacturers that you can trust. You will find their profiles sandwiched in between all of this industry info. Before you start looking over these profiles, though, we recommend you put together a specifications list for reference. Your list should include things like: application, application environment (indoor, outdoor, rain, snow, corrosion, etc. ), standard requirements, budget, timeline, preferred delivery style and preferred installation assistance level.  Once you have put this all together, you can start browsing the companies we’ve listed and their available services. As you browse, frequently consult your list to compare and contrast their services to your needs. Pick out three or four you think have the potential to serve you best, then reach out to each of them for a conversation. Discuss your application at length, and don’t be afraid to ask questions. A good customer service representative will respect your thoroughness and treat you with care. Once you’ve spoken with each company, compare and contrast the information they’ve given you, determining which offers the services and products that most closely align with your needs. Also compare the nature of the conversations, determining which company offers the best customer service. Finally, decide which manufacturer is right for you.